The INTELed Teacher Professional Development Programme (TPD) has been successfully enacted and completed in Spain, at the Hedy Lamarr seminar in the School of Computer Engineering at the University of Valladolid. In Spain, twenty-five (25) special and general education teachers had a unique opportunity to participate in three (3), half-day training workshops, which aimed at supporting them in acquiring knowledge and skills about the use of multi-sensory and embodied technologies in inclusive educational contexts. 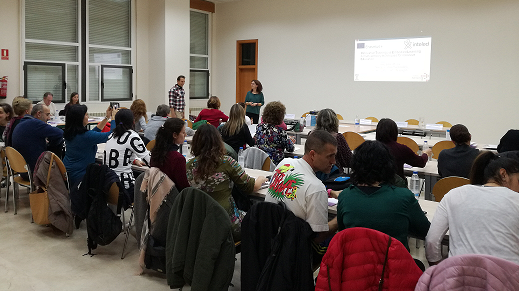 During the first training workshop, which took place on October 30th 2018, the participating teachers were introduced in the INTELed project, its goals, its philosophy and information about the structure and main timelines of the INTELed Teacher Professional Development (TPD). The participating teachers were also introduced in the theory of embodied cognition as well as to the embodied learning pedagogical approach. Finally the INTELed pedagogical framework was presented to support the general teachers and specialists in acquiring knowledge and skills about the use of embodied and interactive multi-sensory techniques for learning and assessment. During the second training workshop, which took place on November 6th 2018, the INTELed teachers had the opportunity to test the embodied digital games and to take the role of students in order to understand better the affordances and limitations of embodied learning games into inclusive educational settings. Specifically, the INTELed teachers tested the KINEMS games and Pictogram room games. During the third training workshop, which took place on November 13th 2018, the INTELed teachers participated in a reflective activity in groups; each group was asked to develop various integration scenarios with the embodied learning games. As part of this activity the teachers had the opportunity to collaborate with other colleagues and share their ideas for an integration scenario, focusing on various aspects such as the classroom orchestration, the activity sequence as well as the inclusion of SEN children. 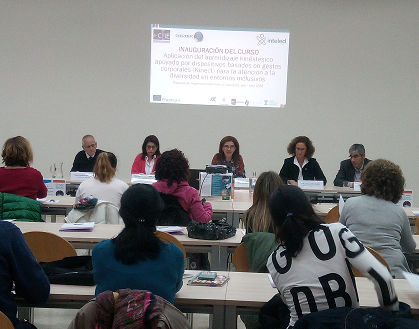 In Spain, the INTELed training programme has been organized and successfully delivered by the INTELed research team of the University of Valladolid: Alejandra Martínez Monés, Sara Villagrá, María Jiménez, Bartolomé Rubia and Eva Fernández.